The "Gib-Caustic Joust" is the new meta. 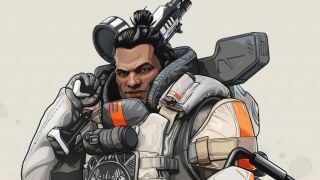 Two months into the game's lifespan, Gibraltar is not considered one of the best Apex Legends. His wide frame is easier to hit than most legends, even after some adjustments in the last Apex patch. His bubble shield and artillery strike are decent situational abilities. But as is often the case in competitive games, players concoct new techniques as the meta matures, breathing new life into underappreciated characters. Gibraltar, as it turns out, is an ideal platform for other characters' throwable items. A recent update evidently made Gibraltar's Gun Shield sticky, allowing Caustic's gas canisters to adhere to them. And because Caustic's gas canisters can be vertically stacked together, up to six canisters can be affixed. This configuration persists as long as a Gibraltar keeps their shield active, which means that Gib can basically walk around with a weird, snaking line of poison barrels attached to him. Nice. The effect is sort of like when you stick a bunch of dry erase markers together to make a sword, as one redditor remarked yesterday. It's a special thing when two lower-tier Apex characters can work together. For now, the name circulating for this technique is the "Gib-Caustic Joust," and Respawn doesn't seem to be too bothered by it. "Behold, our latest innovation in live service balancing buffs for Gibraltar and Caustic! Seriously though, it's pretty incredible the stuff you folks come up with. This is hilarious and very creative," Apex community manager Jay Frechette replied on Reddit. But hang on, what if Pathfinder grapples to the tip of this gassy glitch-abomination? An Apex player (and Overwatch amateur player) named Dommels and his friends made the above breakthrough by throwing the robot in the mix, forming an unholy Voltron of some of the game's less-useful characters and, in the process, accidentally creating Apex's first olympic event. The exploit, if you can call it that, is pretty easy to set up. "You position Gibraltar on ground and he aims towards the sky while shield is up," Dommels told me over Discord. "Caustic on some area that is elevated for example opened lootbox or small cliff or a door then after 2-4 canisters you have to move gibraltar to some higher area for example roof of a building. You don't need to be super accurate as long as you don't hit the edges of Gibraltars shield." Octane's Jump Pad ultimate can also be stuck to Gibraltar, or the Caustic column of doom. This version of the technique is more likely to get patched out of Apex, as we're already seeing players use the combo to create a some kind of terrifying, bouncy Captain America build.